Interior lighting is easy to forget about when you’re involved in the custom home building process, but the fact is, it’s an essential element in having a functional home. Lighting is so essential to interior design that it can sometimes be overlooked—it’s such a simple necessity that we can quickly forget about what makes for good lighting. This is in part because interior lighting is so multifaceted: it’s used as a decoration but also for practical reasons that allow us to better engage with our homes. Certain lamps and fixtures may look great but little to no real value beyond that. A good designer will understand what layering light looks like—taking advantage of ambient, task, and accent lighting to create a full spectrum of light that covers all your needs. 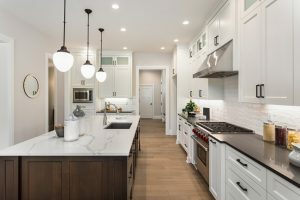 Better understanding what interior lighting can do for you helps you advocate for yourself during the custom home building process so let’s take a look at the basics of interior lighting. Think of accent lighting as the little details that are meant to make something stand out. If you have a collection of something on display, you may want to bring that to attention by using lights that help make that collection stand out. This can be used to help highlight something like a fireplace or a nice piece of artwork. If you really want to go the extra mile for lighting, this is the way to do it. If accent lighting covers the little details, ambient lighting is the meat and potatoes of lighting: the absolute basics. These are the kinds of lights that illuminate large spaces like entire room lights, walkway lights, or staircase lights. Common options include recessed lights, sconces, hanging fixtures, and standing lamps. Making sure to balance ambient lights along with natural lights from windows is always a priority. Task lights are meant to illuminate work-specific areas. In your kitchen, this might mean small LED lights under your cabinets to help you prepare food at night. Bathroom task lighting might include vanity lights that help you get ready in the mirror. A home office may have a light specifically for the desk area to help with productivity. There are a lot of ways to think about how task lighting can improve your custom home. Finally, you want to consider things like switches and dimmers as well as where those elements are placed. Having as much control over your lighting as possible, meaning that switches are accessible and dimmers are installed on lights you may want to turn down, is the best way to design your home’s lighting. This entry was posted on Friday, November 16th, 2018 at 12:27 pm. Both comments and pings are currently closed.